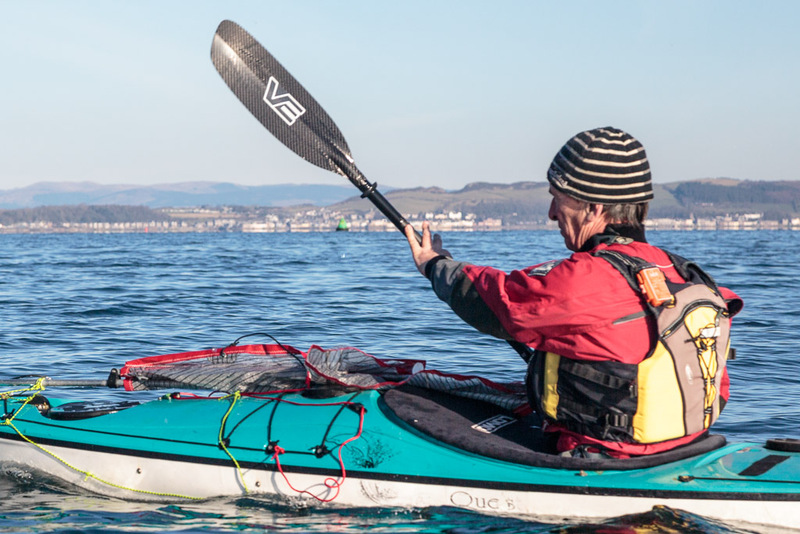 Sea kayaking with seakayakphoto.com: VE Voyager paddle, long term comparative test and review. VE Voyager paddle, long term comparative test and review. 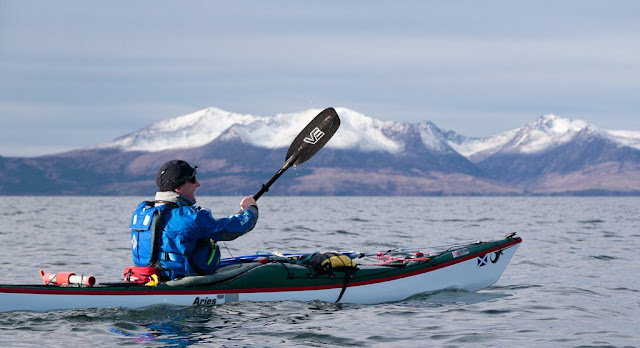 Our little group are great fans of VE Paddles Explorer sea kayaking paddles, David, Mike, Phil and myself all use them. I now want to feed back on an exciting new development: a high aspect touring blade from VE. 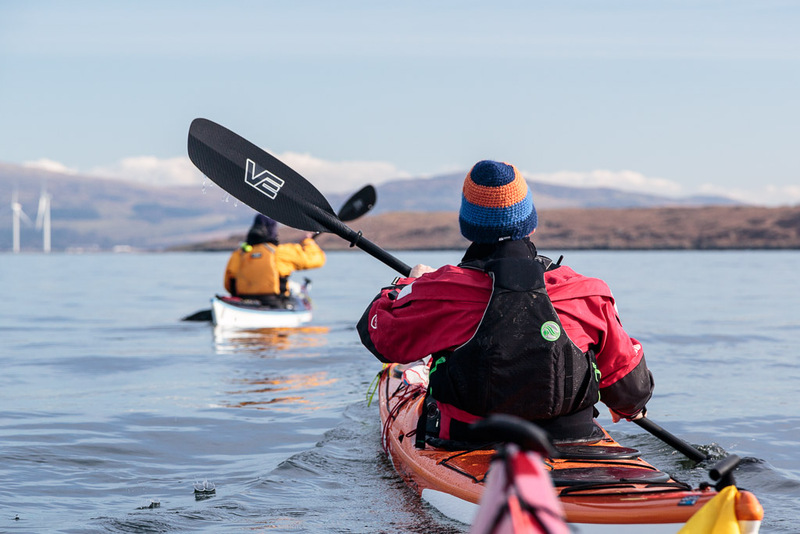 The new VE Voyager AirCore is suitable for both high and low angle paddling and is designed to have a very gentle catch. 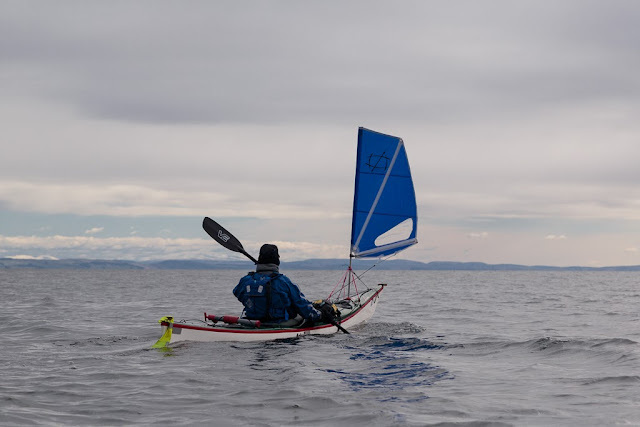 Due to my ill health and inclement weather this review has been much delayed but the paddle has now covered a total of 350km and been paddled by myself and 5 others on a number of day trips which have varied between F0 to F4. 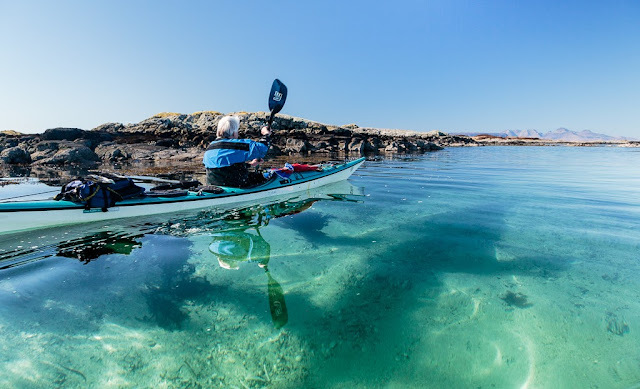 The locations have included the Solway Firth, the Firth of Clyde and the area round the Sound of Arisaig. 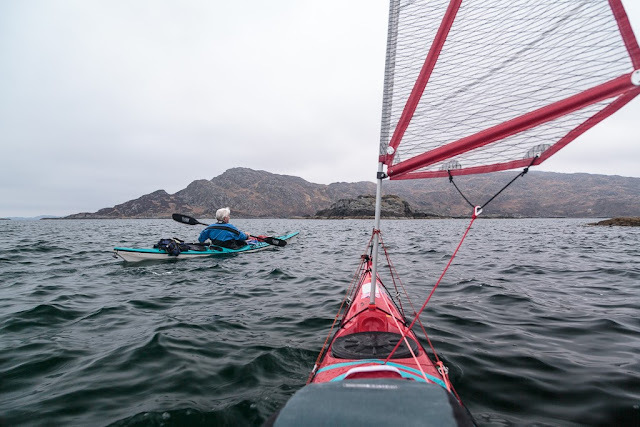 On most trips, we alternated between the VE Voyager, the VE Explorer small, the Werner Cyprus and a Lettmann Blacklight Greenland paddle for 5km each. On other trips Tony who normally uses a Werner Cyprus used the VE Voyager for a 30km trip, and David used the Voyager on 70km in separate tripos. I covered the remainder of the distance alternating between the VE Voyager, the VE Explorer small and large, the Werner Cyprus and a Lettmann Blacklight GP. Phil, above, took to the Voyager straight away. Though Phil is a natural high angle paddler, he liked it both for high angle and low angle paddling. He loved the soft catch, the lack of flutter and the lack of wrist strain even under hard acceleration. He also praised its ability to maintain speed as he disappeared over the horizon. He particularly liked the easy and clean exit. He preferred to VE Voyager to his current favourite paddle the VE Explorer small. Mike alternates between his Werner Cyprus cranks and his VE Explorer small on a straight shaft. Mike commented about how easy and relaxing it was to use the Voyager in low angle style. He particularly liked the gentle catch. He found it very effective for bow and stern rudder strokes. 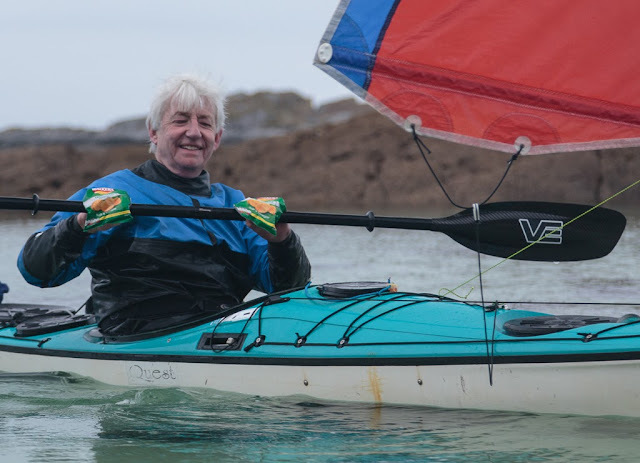 He only tried the paddle in calm conditions and would like to try it in rougher water and surf before giving up on his Explorer. He also noted a bit of give when pulling on the blade. This was almost certainly due to the glass fibre shaft compared with the carbon shaft in his own VE Explorer. Mike felt he preferred the carbon shaft. Original VE two piece join, results in halves being different length. Mike noticed that the split paddle has two different sized halves. This is because the shaft has been cut exactly in the middle so that the leverlock is in the middle when the shaft is at its shortest. (Of course when the shaft is extended, it is offset). He found that the longer half would not fit in his cockpit which has a custom bulkhead, neither would it fit in his Subaru Impreza boot. David also found the longer half would not fit in his BMW E46 3 series boot. This meant we could not put all our gear in the cockpit and get the cockpit cover on when we trolleyed the kayaks onto a ferry or put them onto the roofrack when running a shuttle. Scottish Lendal join, results in two halves of equal length. Scottish Lendal used to cut the shaft to one side of the midline and fit the joining spigot to the shorter half. (The Lendal shaft above is not adjustable in length but Lendal adjustable length shafts were also cut like this.) This results in the two halves being as short as possible, which is the whole point of having a two piece. It makes it easier to transport. I fed this back to Stu at VE paddles and he has taken the comments on board. He will now offer a further option to split the two piece shaft asymmetrically to make more equal halves to suit those customers who need their two pieces as short as possible. Well done Stu! David normally paddles with a VE small blade paddle. He took to the Voyager straight away and particularly liked it for low angle paddling and the gentle catch. He praised it for how light it felt and how little it stressed his arthritic joints giving an effortless feel to paddling. He did wonder if it might feel too light in the water and initially like Mike wanted to reserve judgement until he had tried it in rougher water before deciding whether he preferred it to his Explorer. He did not have long to wait. 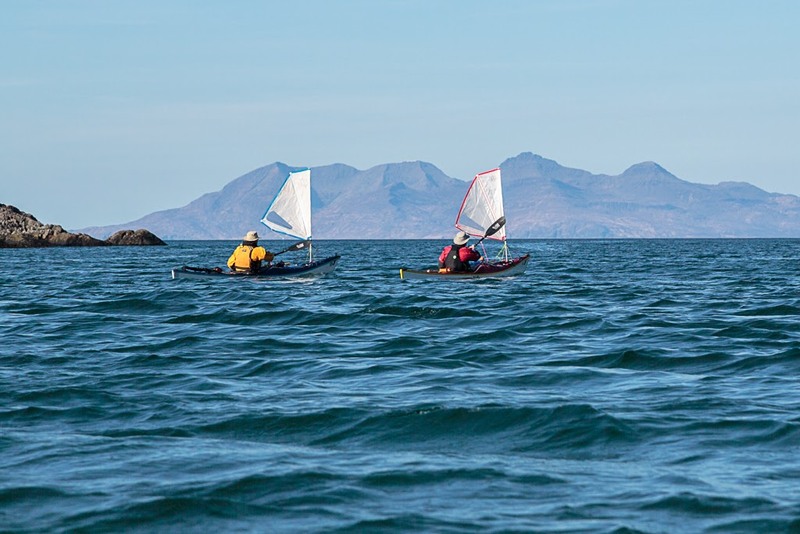 Just after this photo was taken, the west wind got up and blew straight into the south channel of Loch Moidart out of which the east going spring ebb was running. It got rather too rough to take out my Canon 5D Mk 3 but David tackled the rough stuff with gusto. He preferred the slightly bigger Voyager blade to his Explorer small. He also appreciated the softer glass shaft to his stiffer carbon Explorer shaft. At the end of David's 70km with the VE Voyager he was extremely reluctant to hand it back. Indeed I had to wrest it back from his grip. He hung on fiercely despite the cold affecting his arthritic hands. (Note the Walker's crisp bag pogies (sea salt and vinegar of course). 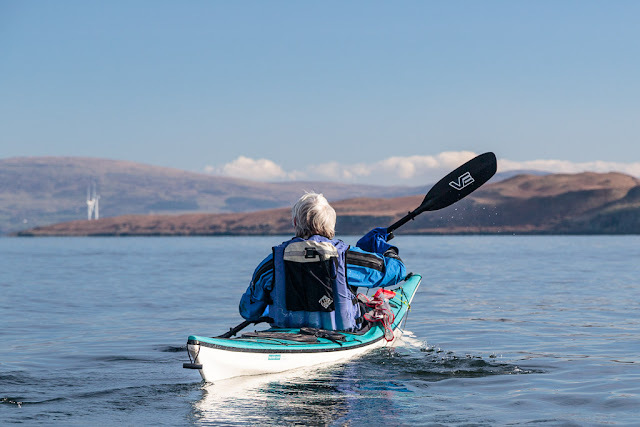 When he first tried the VE Voyager, Maurice had had a long hard day's paddle the previous day and his wrists were aching from not having used his Werner Cyprus paddle for some months. (Both Tony and I also find this if we have not used the Cyprus for a while.) Maurice could not believe how light the Voyager felt when pulling in the water compared to his usual Cyprus paddle. Mike on the left with the Explorer, Maurice on the left with the Voyager at the start of a 37km round of Loch Nevis and Loch Morar. Maurice also commented how the Voyager had a more gentle catch and less flutter than the Cyprus even when accelerating hard. He was also surprised by the power of the Voyager blades. One unexpected result of this particular day was that both Mike and Maurice tried the GP after trying the Voyager. They had each tried the GP once before after using their Cyprus paddles. In those tests neither of them liked the GP. This time they both appreciated the GP more after having tried the Voyager first! 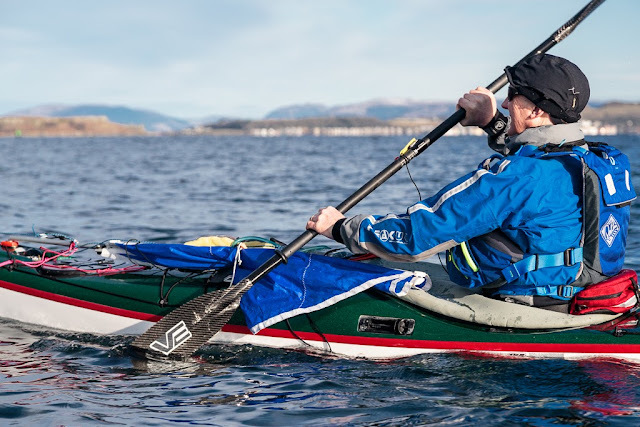 Although Maurice preferred the VE Voyager to his own Werner Cyprus and is looking for a second paddle, he felt the Voyager was too close in style to his Werners and is thinking of buying a GP as a second paddle. Tony was very surprised about how powerful the Voyager was despite the gentle catch. He could not wait to sprint ahead. He thought it worked very well when pushing on but without causing strain. He, like me, had only paddled once in four months and though his muscles were aching after the 30km crossing to Arran, he did not complain about sore joints, which he had noticed on the same crossing after a similar lay off. On that occasion he used his Werner Cyprus. He found the Voyager paddle to be a bit heavier in the hands than his Cyprus and said he would be keen to test the Voyager with cranks on a carbon shaft. As far as my own impression is concerned, I echo the comments about clean entry and exit, the gentle catch, the surprising power with lack of flutter and the low strain on my joints when pushing on. Like Phil, I found the Voyager worked equally well in high or low paddling styles and it certainly is no slouch if you are paddling hard with a high angle stroke (which both Phil and Tony favoured when using the Voyager). 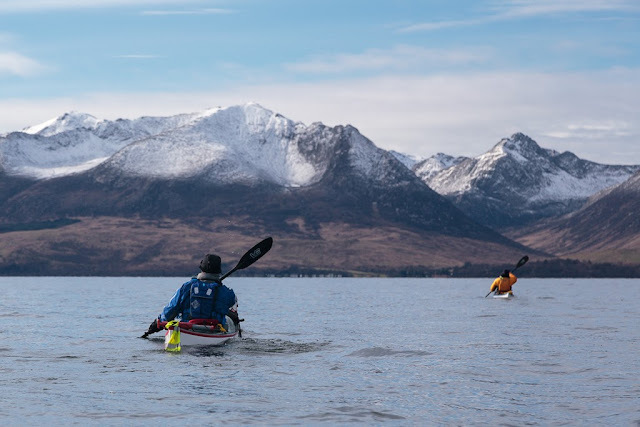 Due to the recent weather we have not yet tried paddling when loaded on a camping expedition but the ease of paddling on a day trip bodes well for their use when loaded on longer trips. With regard to the Voyager shaft on test, it is made of glass fibre rather than the carbon in the Explorer shafts we were comparing it with. I am sure that this contributes to the lack of strain on the joints. It does not lead to a noticeably heavier paddle. Tony did note a weight increase over his Cyprus paddle but it does not have spigot that allows extension by 10cm. Phil thought the Voyager was lighter than his Explorer with carbon shaft! (Maybe this was due to the lower swing weight due to the high aspect blade). The shaft was a two piece with the excellent lever-lok which gives infinite adjustment of feather and 10cm difference to length. It has also proved remarkably reliable. (In comparison, I like many people, have discovered that the Werner joint can wear to give play (four of us use Werner Cyprus paddles and two have developed play). SystemX the UK importer have been very supportive of affected customers and have arranged for a good number of replacement splines to be fitted though this means doing without your paddle for up to six weeks as it is sent to the USA. 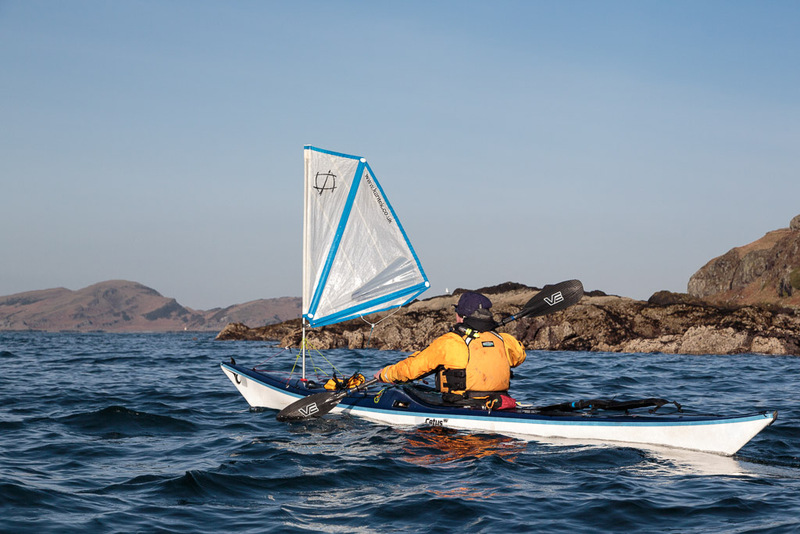 Being able to shorten a paddle by 10cm makes a great difference at the end of a long hard day, especially if against wind or tide. In comparison, the fixed length of the Werner Cyprus can be tiring at the end of a long day. The Voyager paddle was supplied with optional indexing on both sides which suits those that like to paddle with a low feather angle. All of us who use Werner Cyprus paddles appreciated this as they are also indexed on both sides. The Voyager index was a comfortable shape and had a nice smooth but matt finish which gave a very good grip. The indexing was perfect with the shaft set to the shortest length. However, at full 10cm extension only half of my hands' width were on the indexing and I think the indexing should come further in. At full 10cm extension the indexing is 55cm apart, which is great for the wider grip when high angle paddling. When using a low angle paddle style, I tend to keep the hands a bit narrower, about 50cm apart. This was the distance apart that Scottish Lendal used on cranked paddles for touring compared with 55cm for their performance cranks *. A narrower grip contributes to the relaxed nature of low angle paddling as you lift the hand less high on the forward stroke. On a long paddling day this saves your shoulders a lot of lifting. I fed this information back to Stu at VE paddles and guess what? Flexible and obliging as always Stu now offers the paddle grip indexing on not just both shafts but it now extends further in to keep your hands on the indexing even when the paddle is fully extended. Durability. The test paddle had already been used before we took delivery. At the end of this test the blade edges were pristine, despite several rocky encounters. This is a very hard wearing paddle design which is much more resistant to damage than foam core blades from other manufacturers. The joint mechanism operated faultlessly throughout the test. In conclusion, the VE Voyager seems to have found a real sweet spot for sea touring blade shape. It is an outstanding touring paddle. Despite a gentle catch it has a powerful, flutter free blade that allows both low and high angle paddling styles. I think the degree of flex in the fiberglass shaft compliments its intended use as a touring paddle and personally I am willing to trade a little extra weight for the shaft's greater flexibility. 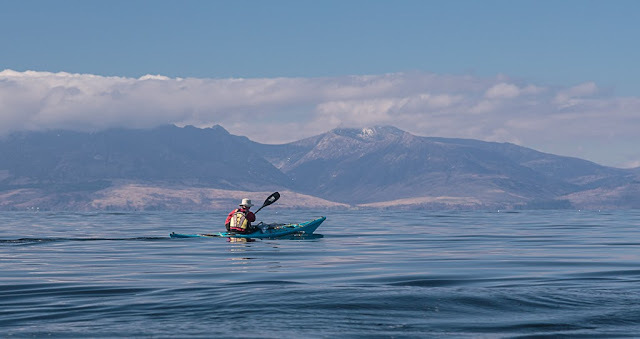 The ability to shorten the shaft at the end of a tiring day, on the water and without tools adds to its suitability as a long distance touring paddle. Lastly the ability to customise and tailor the design to your exact requirements by talking directly with the manufacturer and designer sure beats buying an off the shelf, mass produced product. VE Voyager AirCore carbon fibre blades, two piece, glass fibre, straight shaft 2.15-2.25m, 860g, blade area 642cm2, price as tested £294.00. The VE Voyager AirCore (and Explorer AirCore) blades are available in carbon and the shafts are available in a wide variety of specifications: straight or cranked, in glass or carbon and indexed on either or both sides. * Leif commented about using a slightly narrower grip for a low angle paddling style. Interesting review as always, Douglas! Your text gave me some new insights not specific to your choices of paddles. First the result of having a stiff carbon shaft compared to a somewhat softer and heavier glass fiber shaft and that the latter was experienced gentler to wrists by several of your fellow paddlers. It's a very good reason to not have a carbon shaft for many of us. Even nature rewards a little agility in front of stiffness. The second part of the text is your mentioning of narrowing your hands when low angle paddling so you don't have to lift your hand so high on a forward stroke. It's a deficiency in my education not to know this earlier. I've been using a Werner Kalliste (643cm2) two piece for some years and is very pleased with its joint and performance. Having said that I would now in hindsight chosen a paddle with a lesser area on the blade, and perhaps even a glass fiber shaft! Olympics. 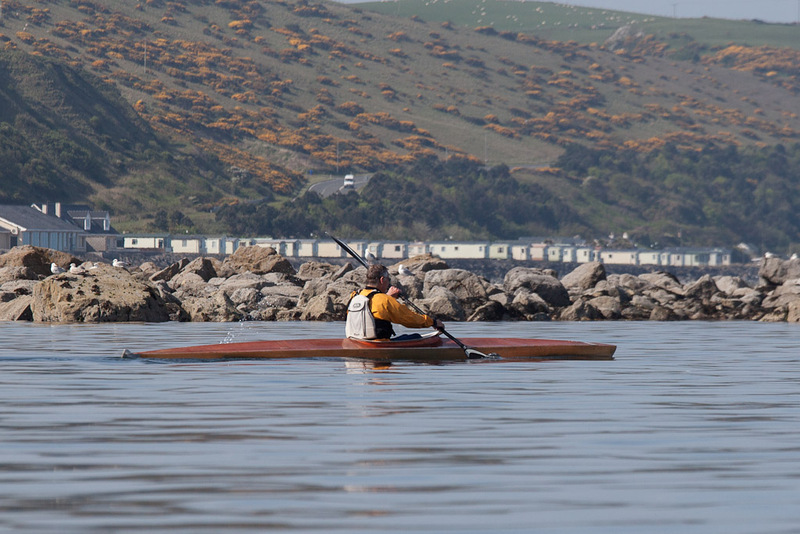 After he retired from Lendal he continued to paddle recreationally covering large distances rather quickly. He had also changed his paddling style to a much lower angle than his racing stroke.